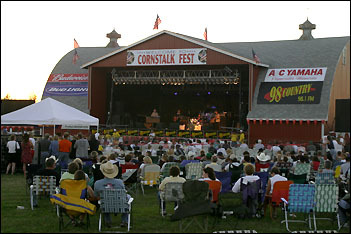 Longtime concert fans share their favorite memories of Cornstalk. In 1989 Mike Kampsen, owner of the County Line Bar and Grill, wanted to do something nice for his father, a huge Johnny Cash fan. While his friends and employees thought he was wasting his time, Kampsen went about booking his father Herman's idol - "The Man in Black" - to perform a concert in the cornfield next to his bar. According to Kampsen, the rumor that he started the festival on a bet is just that - a rumor. He said a lot of bets were made that he would never be able to pull it off. Named Regal Fest in its first year, the festival got its current name from Cash himself. According to Kampsen, Cash mounted the stage, looked around, and proclaimed, "Twenty years ago there was Woodstock. This is Cornstalk." The crowd loved it, said Kampsen. "When Johnny sang, 'I Hear a Train,' a train actually went past and blew its whistle," said Jeanette Kalthoff of Spring Hill, who attended the concert with her husband Melvin. The couple's first year experience was so good that they have worked as volunteers every year since, she added. Kampsen's father, also known as Hermie, didn't know it when he took his seat at the concert, but he was about to get the thrill of his life. Kampsen had made prior arrangements for his dad to get up on stage and sing with Cash. "What I remember most, besides the train song, is Hermie Kampsen singing with Johnny," said Kalthoff. "When Johnny said, 'Is there a Hermie Kampsen in the audience?' I thought my dad would fall off his chair," said Kampsen. The duo sang the first song Cash ever recorded, "Mean Eyed Cat." Since 1989, dozens of country stars - including Merle Hagard, Waylon Jennings, Willie Nelson, Charlie Pride, and Martina McBride and now Charlie Daniels and Mel Tillis - have come to Regal. And Cornstalk traditions, some born during the first concert, have developed over the years. 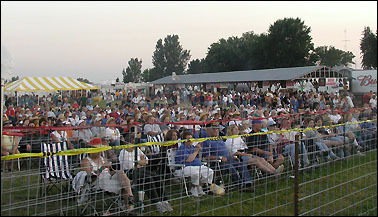 The first concert was held on a rented stage - the festival's trademark red-barn stage still sat on a neighboring property - and power for the sound system was provided by a generator. Kampsen estimated that the first festival drew 8,000 people, with Cash as the only performer. Corrine Leiser of Lake Henry was one of the first people in line to see that first concert. She and a group of friends got in line at 5 a.m. to get seats at the concert. Since tickets were general admission, when the gate opened at 7 a.m., the group ran like mad to set up their chairs in the front row, said Lieser. Seeing Johnny Cash so close to home was a big deal, and they wanted to be as close as possible, she added. After getting their spots, they went home and made a potluck meal to share before the concert. Now that routine has become tradition. Every year, the women wait in line to claim their spaces while their husbands work. Once they have their spots, they tie all of their chairs together so they know that when they come back for the concert, they will get to sit together, and they still have their potluck supper, complete with strawberry pie. According to Bruce Westpahl of Brooten, who was recruited to be a volunteer at the first festival and has worked at each one since, no formal arrangements were made for camping that first year, but a few guys asked Kampsen if they could camp. He said O.K. and charged them a few bucks, thus creating the tradition of camping - and partying - on the festival grounds. Lucy Swanson of Baraboo, Wis., remembers almost every detail of almost every concert held in Regal since 1989. She remembers the Johnny Cash concert like it was yesterday, she said. "It was hell-fire hot and dry. When that train blew its whistle during the train song, I thought I would die," she exclaimed. Back in 1989, she was traveling through Minnesota with her husband in a motorhome. They had been in South Dakota where they had seen another concert and heard about the concert in Regal while on the road. It wasn't too far out of their way, so they made it for the first concert. Since then, the only times she hasn't been at Cornstalk was in 1996 when her husband died and in 1998 when no concert was held. Although she no longer camps at the festival, she admits that there have been some wild times in the campground. "Most of my Cornstalk memories can't be printed," she grinned. "This was CRP land, and it had just been mowed, so stuff was blowing all over because it was so dry. The rain actually came right after the concert," said Westpahl. "What I remember most about Johnny Cash was his belt buckle," said Pam Narragon, who was 18 and sold beer during the first concert. Narragon, who has seen Cash at other venues, remembers him as a friendly performer who gave a good family show, and she still remembers the huge, diamond-encrusted belt buckle that he wore that night. Reggie Evanson, who lives near Willmar, also remembers Cash's belt buckle. "I was 18, and I hated country music, but my mom talked me into going with her. There was a full moon that night, and I remember thinking that it was romantic,"Êshe said. Of course, to an 18-year-old girl, almost anything can be romantic, she added laughing. Now a devoted country music fan, Evenson has only missed a few years since. This year she brought her own daughter - who still dislikes country music. "Maybe she'll change her mind," said Evenson, who already has herself.